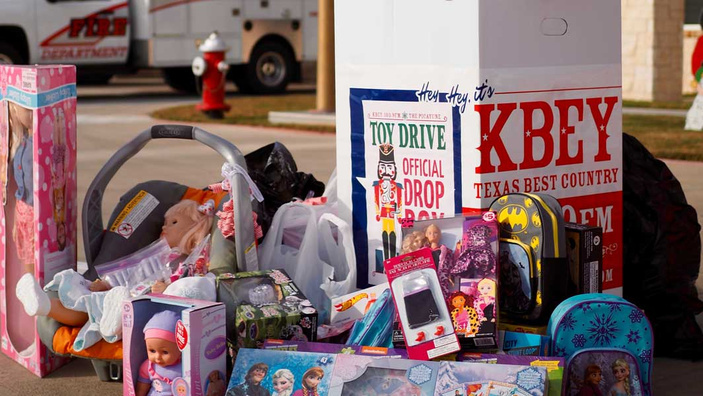 MARBLE FALLS — The day has come for the annual The Picayune/KBEY 103.9 FM Radio Picayune Toy Drive. With two main drop-off locations Wednesday, Dec. 7, you can help make a child’s Christmas dream come true. KBEY and The Picayune staff will be set up from 6 a.m.-3 p.m. at the Burnet Fire Department, 2002 S. Water St. in Burnet, and Chevy-Buick of Marble Falls, 2301 U.S. 281 in Marble Falls. Kay Baker and Ed Chandler of the KBEY “Wake Up Call” will each be at one of the locations. And, it’s been confirmed that Santa Claus will be making appearances at both spots during the day. Time depends on his reindeer. The annual toy drive benefits Highland Lakes Christmas is for Kids and Burnet County Santa’s Helpers. Highland Lakes Christmas is for Kids, one of the longest-running programs of its type in the Highland Lakes, serves children in need in a portion of southern Burnet County, including students within the boundaries of Spicewood, Marble Falls, and Colt elementary schools. Burnet County Santa’s Helpers, with the support of the Burnet County Sheriff’s Office, works to make sure kids in the northern part of Burnet County find presents under the tree on Christmas Day. Both organizations provide the gifts to financially struggling families. Volunteers from both also cross-check and share information with their respective organizations and others to ensure nobody is getting gifts from two or more of the charities. Both gifts and cash donations will be accepted. If you can’t make either of those locations, there are several Highland Lakes businesses and locations with collection boxes set out. These include: Ken’s Heating & Air, 2102 Commerce St. in Marble Falls; Attorney’s Abstract Co., 205 S. Pierce St. in Burnet; Hill Country Collision, 1425 U.S. 281 South in Marble Falls; Cricket Wireless, 1904 U.S. 281 in Marble Falls; Freemon Shapard & Story, 608 U.S. 281, Suite 102, in Marble Falls; Sprint Store, 2511 U.S. 281 in Marble Falls; Bulldog Bodywerks Collision Center, 1304 Buchanan Drive in Burnet; and Galloway Insurance, 1310 S. Water St. in Burnet.